In this new Hubble image two objects are clearly visible, shining brightly. When they were first discovered in 1979, they were thought to be separate objects — however, astronomers soon realized that these twins are a little too identical! They are close together, lie at the same distance from us, and have surprisingly similar properties. The reason they are so similar is not some bizarre coincidence; they are in fact the same object. These cosmic doppelgangers make up a double quasar known as QSO 0957+561, also known as the “Twin Quasar,” which lies just under 14 billion light-years from Earth. Quasars are the intensely powerful centers of distant galaxies. So, why are we seeing this quasar twice? Some 4 billion light-years from Earth — and directly in our line of sight — is the huge galaxy YGKOW G1. This galaxy was the first ever observed gravitational lens, an object with a mass so great that it can bend the light from objects lying behind it. This phenomenon not only allows us to see objects that would otherwise be too remote, in cases like this it also allows us to see them twice over. 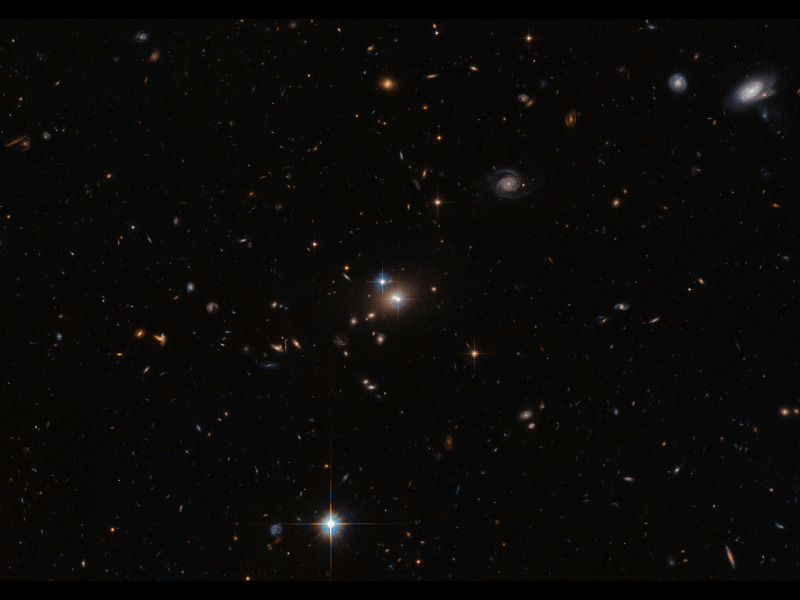 Along with the cluster of galaxies in which it resides, YGKOW G1 exerts an enormous gravitational force. This doesn’t just affect the galaxy’s shape, the stars that it forms, and the objects around it — it affects the very space it sits in, warping and bending the environment and producing bizarre effects, such as this quasar double image. The first detection of gravitational lensing meant more than just the discovery of an impressive optical illusion allowing telescopes like Hubble to effectively see behind an intervening galaxy. It was evidence for Einstein’s theory of general relativity. This theory had identified gravitational lensing as one of its only observable effects, but until the observation of these quasar “twins,” no such lensing had been observed since the idea was first mooted in 1936. Me thinks someone is trying to tell us something. Like, this is your last warning peoples..
NASA sees Han Solo on planet Mercury..
A photo of the surface of the planet Mercury has set astronomers giggling with what appears to be Star Wars’ hero Han Solo — frozen in carbonite. “If there are two things you should remember, it’s not to cross a Hutt, and that Mercury’s surface can throw up all kinds of surprises,” the NASA website posted. The region of Mercury’s surface was shaped by magma ejected during the formation of the Caloris basin. The body-shaped lumps may be remnants of what was there before. The Messenger spacecraft is the first sent in to orbit the inferno planet closest to our Sun. 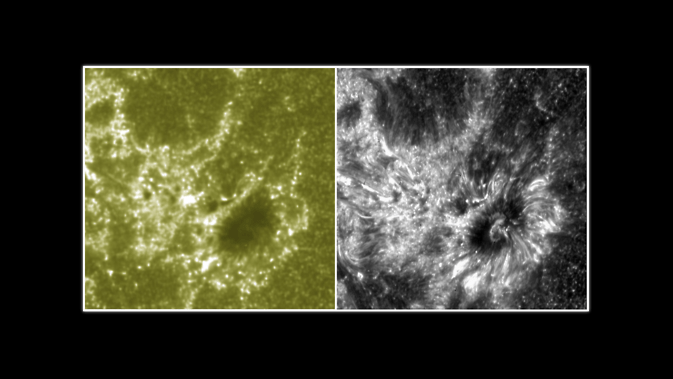 During its two years of operation, it has so far taken more than 150,000 images as well as many other sensor readings. Get more science and technology news and reviews at News.com.au. A View of Mercury From Afar.. 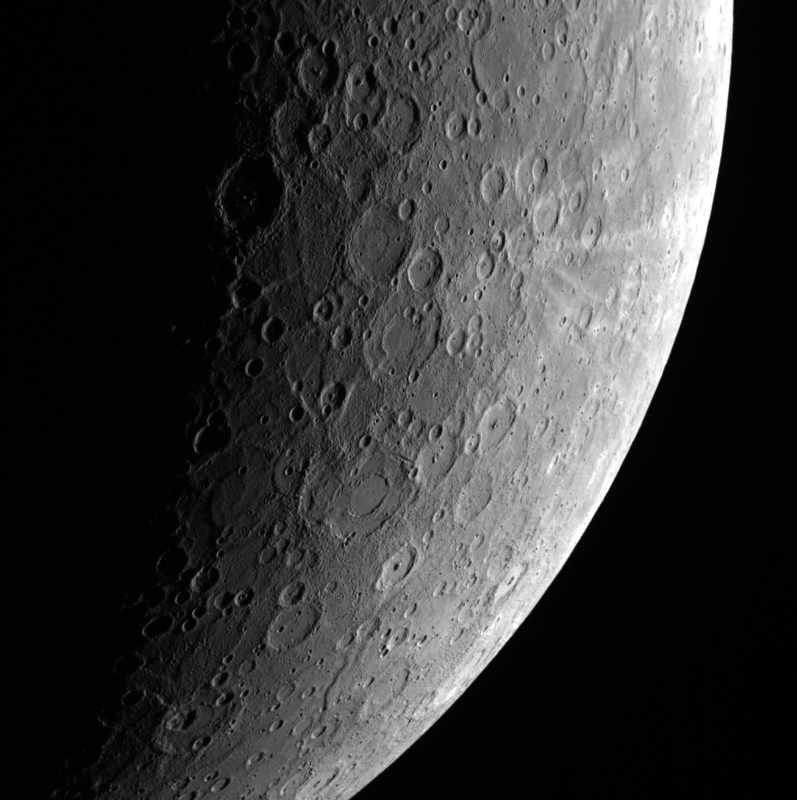 This image of Mercury, acquired by the Mercury Dual Imaging System (MDIS) aboard NASA’s MESSENGER mission on April 23, 2013, allows us to take a step back to view the planet. Prior to the MESSENGER mission, Mercury’s surface was often compared to the surface of Earth’s moon, when in fact, Mercury and the moon are very different. This image in particular highlights many basins near Mercury’s terminator, including Bach crater. Many craters with central peaks and the nearby bright rays of Han Kan crater are also evident. Once per week, MDIS captures images of Mercury’s limb, with an emphasis on imaging the southern hemisphere limb. These limb images provide information about Mercury’s shape and complement measurements of topography made by the Mercury Laser Altimeter (MLA) of Mercury’s northern hemisphere. Pioneer 11 Image of Saturn and its Moon Titan.. The Pioneer 11 spacecraft launched from Cape Canaveral forty years ago, on April 5, 1973. Pioneer 11’s path through Saturn’s outer rings took it within 21,000 km of the planet, where it discovered two new moons (almost smacking into one of them in September 1979) and a new “F” ring. The spacecraft also discovered and charted the magnetosphere, magnetic field and mapped the general structure of Saturn’s interior. The spacecraft’s instruments measured the heat radiation from Saturn’s interior and found that its planet-sized moon, Titan, was too cold to support life.